Who wouldn't want to be progressive? Isn't progress the goal? Click on the photo to take the quiz yourself. I got up to question 31 and got pissed that it was taking so long and quit. I'm already well aware that I'm extremely progressive, I use my conservative co-workers as a litmus test daily, lol. 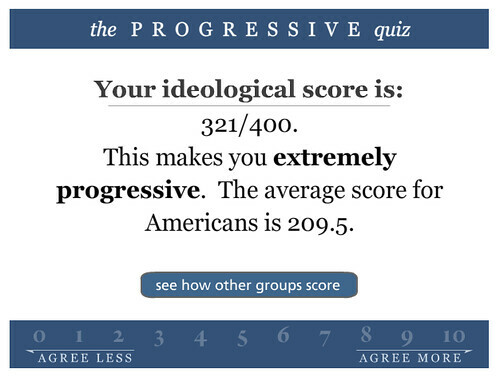 199. they call that conservative, but i prefer to think of myself as progressive-lite. Thanks for sharing. I posted it on my blog as well and linked back to you. Matt, I expect you to do better next time. Solarjinx, your stamina suggests Libertarian. mkf, we know you're a hell-raiser.